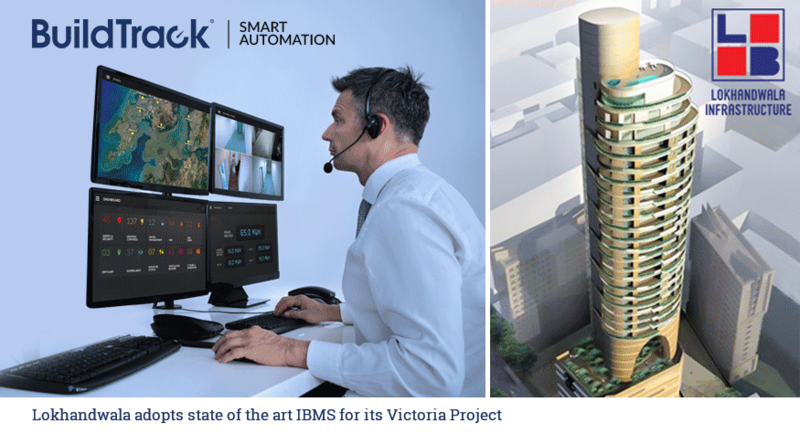 Lokhandwala has implemented an Building Management System(BMS) to provide complete centralized monitoring of the building and its apartments within landmark project, Victoria. The exclusive 55 storied tower located in Worli, the heart of Mumbai City offers view of the Arabian Sea. The Building Management System, from BuildTrack offers monitoring of facility level assets and systems – from water tank levels, pump status, fire systems, elevators and apartment level safety and security sensors. It also offers control of common area lighting and other control features all from a central kiosk and mobile apps. Victoria is the first residential building in India to have such an extensive BMS to ensure improved safety, security and operational ease for facility staff. BuildTrack BMS (Building Management System) solutions are aimed at providing complete control and monitoring of buildings and communities to make them safer, more secure and to improve their facility operations. Click Here to know more about BMS. About Lokhandwala (http://www.lokhandwalainfrastructure.com): Lokhandwala Infrastructure is a professionally managed ISO 9001: 2000 Certified Company specializing in Real Estate Development. They have several prestigious projects in Central & South Mumbai and Dubai, covering over 30 million sq. ft.
About BuildTrack (www.BuildTrack.in): BuildTrack is a leading brand of Smart Automation & Internet of Things products and solutions from Surmount Energy Pvt Ltd. BuildTrack solutionss deliver Safety, Security, Sustaniabilty, Comfort, Convenience and Operational Productivity. BuildTrack manufactures its own line of sensors, controller, switch nodes, cloud services, smart apps and more to deliver a number of reliable wired and wireless automation solutions for homes, offices, buildings, hospitals, hotels, warehouses, corporations, BMS, Energy Efficiency and more.